LAUREL, MD— The entrance to the debate over Pluto's planet status said it all: Withtechno music blaring in the background, the two debaters and a moderator walkedinto the auditorium, cameras flashing and the audience clapping. Onedebater, NeildeGrasse Tyson, did the boxing entrance à la Rocky. That's how hot thematchup is between Pluto as a planet and Pluto as a plutoid. Tyson,director of the American Museum of Natural History's Hayden Planetarium in New York, supports the demotion of Pluto. In the other corner, Mark Sykes, director of thePlanetary Science Institute in Tuscon, Ariz., does not agree with the recentruling that essentially booted Pluto from the planet lineup. The debateover whether Pluto should be considered a planet is part of "The GreatPlanet Debate: Science as Process" conference here at the Johns HopkinsUniversity Applied Physics Laboratory (APL) that runs through Saturday. Before theidea-throwing began, debate moderator Ira Flatow of National Public Radio's ScienceFriday threw out his own rule, "No throwing of perishable items ormissiles of any kind at the stage," Flatow said with a smirk. In fact,the debate was filled with lots of applause, laughter and some snide remarks,but mostly it was a friendly tussle. In fact, neither Tyson nor Sykes clearlydefined their specific positions on Pluto and the definitionof a planet. In general,Tyson said astronomers need to come up with an entirely new lexicon to groupplanets and planet-like objects together. He also said Pluto is not like theother eight major planets in the solar system and that it instead fits into theKuiper Belt, a vast region of objects beyond the orbit of Neptune. "And Iam certain Pluto is happier there," Tyson said. Sykes saidthat if a non-stellar object is massive enough to be round and it orbits astar, it ought to be a planet. Under this definition, the solar system wouldhave 13 planets, although more might be found in the future beyond theorbit of Pluto. In addition to Pluto and the other eight major planets,these would also include Ceres, Pluto's moon Charon, Eris, and recentlydiscovered Makemake. In responseto Sykes wanting to call all of these objects "planets," Tysonresponded, "You need that word. I'm saying define it however you want andthen recognize how useless it is and then find another term to group objects oflike properties that are useful to planetary scientists," Tyson said. Tyson wouldrather not count planets and instead group objects together that have similarproperties, even if that means having handfuls and handfuls of planets. The debatemarks another chapter in the Pluto saga, which began when Pluto was discoveredin 1930, as this object was an oddball compared with its solar system buddiesin its eccentric orbit, small size and low mass (it is less massive than Earth'smoon). Someargued, then, that Pluto didn't fit in with the rest of the solar systemplanets. The plot thickened in 2004 with the discovery of Sedna, an objectabout three-fourths Pluto's size and about three times as far from the sun. IfPluto fits the planet build then so would Sedna. Caltech'sMike Brown added another twist to the story in 2005 when he announced thediscovery of 2003 UB313, a hopeful10th planet in our solar system. The object was round, orbited the sun, andthe kicker — it turned out to be larger than our then ninth planet, Pluto. In2006, UB313 was officially named Eris. 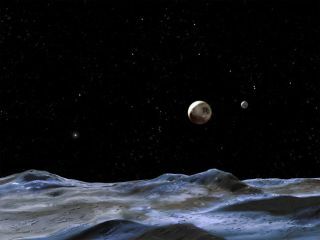 "ThePluto controversy boiled up when Eris came up, because you couldn't leavethings the way they were," said Jack Lissauer of NASA Ames Research Center in California. "You really had to contort things to say Pluto was aplanet and Eris wasn't. Things really came to a head." Since then,the International Astronomical Union (IAU) has labeled Pluto a "dwarfplanet" and then later, a "plutoid." Many planet scientistswere disgruntled over the 2006 IAU decision, which they said involved a vote ofjust 424 astronomers out of some 10,000 professional astronomers and many otherplanetary scientists around the globe. "Havinga group of graybeards getting together and issuing a formal definition is not agood idea," David Morrison of NASA Ames, told SPACE.com, referringto the IAU's 2006 vote. Hal Weaverof JHU's Applied Physics Laboratory, called this week's debate "a realscientific conference to lay out all the issues and discuss them." ButLissauer pointed out that even this conference has its flaws. "Thismeeting isn't representative of planetary scientists either. There is a very,very skewed distribution," Lissauer said during a panel discussion. At the endof the debate, Pluto, as far as many astronomers are concerned, remains in somesort of limbo. And closingthe debate, Sykes said, "I get the feeling Neil [Tyson] is coming over tothe right side of the fence."